Our idea for the intervention was to give each child a square piece of cardboard, they could paint / draw their dreams or interests. 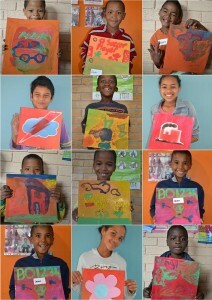 Some boys painted more than one square and got a chance to experiment with the different art mediums. A collection of a few of the boys’ artwork can be seen in the figure below. The older boys created their own stencils and used spray cans. ‘Taking our world Piece’ was created by putting all the painted squares together and an image of the world was formed in the center. The aim was to attach all the squares together, frame it and display it on the wall in their recreation hall. Hopefully the boys can look at their square that is part of the mural and feel inspired to make their dreams come true. This entry was posted in 2013 and tagged 100in1day, art, children, painting, volunteers. Bookmark the permalink.